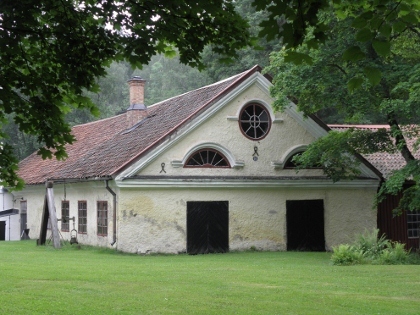 The Engelsberg Ironworks were one of the most important ironworks in Sweden, which was the economic leader in the field of iron for two centuries. It was unique in Europe due to its modern machinery and construction. Iron mining and smelting in this area started to take on some scale in the 17th century. Production ceased in 1919. 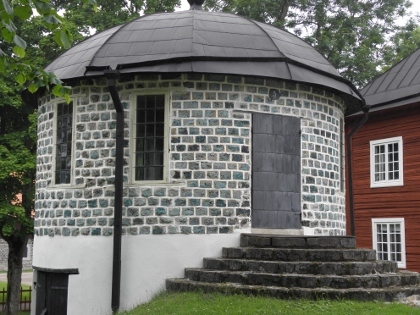 Most of the 50 technical and related administrative buildings have been conserved and are open to visitors in summer. This is really a small site, in a remote corner of a landscape of lakes and forests, dotted here and there with more early industrial remains. One can enter the site freely, there's no entrance fee. In about 5 minutes I thought I had seen it all. The most impressive sight is the big furnace, that's the large red building that you see on every photo of this WHS. At 10 a.m. the small cafe/shop on site opened, and I went in to pick up an audio guide. This is a service to non-Swedish speakers, as tours are only given in Swedish. You then can tag along with the Swedish guide, which is the only chance to see something of the interior. I was too early for a tour however, and did my walking tour alone. At the other end of the complex lie some other interesting buildings including the smelting house. It's a pleasant walk out there, and I liked that so many parts of the early industrial complex have survived. I visited this WHS in June 2018. 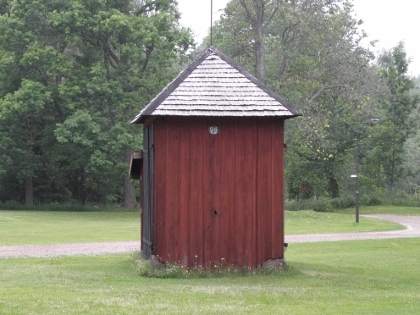 Apart from the falun red earth-and-timber furnace with engraved milestones (photo), the other components of this WHS are quite similar to the agricultural and idyllic setting of the decorated farmhouses of Halsingland rather than part of an industrial landscape. The ironmaking traditions of the Norberg mining district go back to the Middle Ages even though iron had been worked at Engelsberg since prehistoric times. In summer, guided tours can be pre-arranged everyday by contacting the tourist office in Fagersta, but make sure to have some kroners as only cash is accepted (very rare in Sweden!). The area can be easily visited for free without a guide by following the numerous information boards. To me, the highlight of this WHS was the area around the manor house with the clock tower, two ornamental slag-stone towers and the nearby forge powered by waterwheels. Opposite the ferry point to the world's oldest preserved oil refinery on Oil Island, make sure to visit Nya Serveringen, an excellent place to have some shrimp skagen and freshly baked pastries. All in all, the WHS in Engelsberg was a worthwhile picnic stop en route to Falun. As previous reviewers have pointed out Engelsberg doesn't feel all that industrial for an ironwork. Embedded into the typical Swedish landscape with lakes and forests, it has more the feel of a large picturesque agricultural estate. And in a way it was precisely that as the surrounding forests and lakes were key resources used in processing the iron ore. I felt reminded of Ironbridge Gorge. This is what it must have looked like before the English moved from charcoal to coke. The site was operated well into the 20th century. It's interesting to consider how long these types of production techniques were competitive. To me the site could well be extended into a cultural landscape. The Fagersta region to this date remains a center of iron production in Sweden. 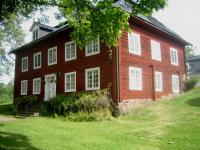 Several relevant sites are grouped into the Ekomuseum Bergslagen. These could provide some more context and background on Engelsberg. As is the case all over Sweden, high season is from mid-June to mid-August. In this period there are regular guided tours and the visitor center is open. Outside this period you can contact the visitor center to arrange a tour for you. My hunch is, though, that it will be mostly closed and you are left to your own devices. Note that near the train station there is also a tourist information with potentially more generous opening hours. Exploring the site on your own is not much of a problem, though, as you can roam the premises freely on your own. A map of the premises is shown near the parking lot with the recommended trail. Note that some parts of the site are still inhabited and off limits for visitors. Sign posting will indicate as much. The size of the site is rather limited, but exploring the nearby lakes and forests is well worth it. 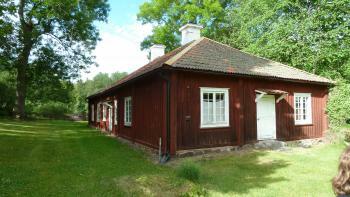 Coming from Stockholm I stayed overnight in Västeras, a pleasant little town on a lake. From Västeras there is a train running to Fagersta that stops in Ängelsberg. It runs at least every two hours, even on the weekend. From the train station it's a less than 30min walk to the site with a nice sculpture park to explore along the way. If you need to connect to Arlanda airport, there are direct buses to Arlanda airport from Västeras. If you arrive in Swedish high season or on a weekend you can take a ferry to visit the world's oldest still existing refinery on an island just across the shore from the train station. From Fagersta you are able to connect to Falun via Ludvika. As with others my main memory of this site was how idyllic it looks now, this may stand as an obstacle to understanding its industrial past but it does make for a rather enjoyable stop over. A bit of a navigational glitch (I got us lost) meant we arrived just as the doors to the little museum closed, as such we had to make do with strolling around the well preserved wooden buildings. The main ironworks were impressive but I could only really guess at how it functioned. Initially I thought that this was the limit of the site however it was pretty clear that there was more too it. The immaculately preserved collection of workers houses and storage buildings proved to be a wonderful place to wander around on a bright Northern European night. The babbling water drew us towards the forge and also allowed us to watch the impressive bird life in the abundant trees. All in all it was a lovely place to visit, it was tough to get a grasp of the industrial importance of the site, but perhaps the museum and guided tours could address this. After almost 2 hours on the train from Stockholm, I was in the town of Ängelsberg next to the idyllic Åmänningen Lake, this small town was very pretty with many cute wooden houses, hard to believe that I did not came for summer vacation, but to see industrial site – the Engelsbergs Ironworks. From the train station, it was a really nice 1.5 Kilometers walk to the complex, passed cute sculpture park and a big tree house along the small lake. The complex of former ironwork mill, the World Heritage Sites, was located well in the middle of the forest, so lovely that may misunderstand to typical farming village. Almost every building was painted in red or black, a great contrast to very bright green forest under the blue sky of spring. The biggest building was the former iron smelting building; from outside it was looked like a big farmhouse for livestock, a good example of early industrial architectural style which still based on agricultural building type. Behind the Smelting building was the large complex of worker village built in the different styles depend on construction periods. The village was lovely with great surroundings, I was not sure that the beauty landscape was an original or not, if it was, this place may be one of the most beautiful factory I’ve see. The complex had everything for workers including brewery! My friend whose great grandfather, migrated from Wallonia, was once worked in Engelsberg even said that he hard to believe the hash life story his father told him about their ancestor when we saw this lovely place. Then I walked back to Ängelsberg for lunch before back to Stockholm, all in all, a nice half day trip to see this idyllic place. In my opinion, Engelsbergs Ironwork is a fine place to see and very accessible by frequent trains connect to Stockholm. As I mentioned this place is hard to believe to be industrial site, in order to appreciate this place, visitor should make a bit of research to understand its history, but if not, just come to admire the real Swedish rural landscape, lovely lake, and cute Swedish red houses, Ängelsberg is a perfect place, maybe better than spend a whole day in Stockholm’s Skansen for set up cultural village. This is a very unusual site - a major ironworks and one of the first industrial production sites in the world, yet it has a pretty idyllic location in the midst of a Swedish forest. Everything here is perfectly preserved, and there are guided tours (with English audioguides) to show you around. 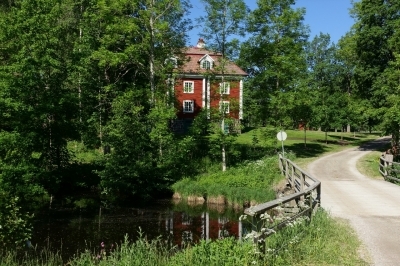 The complex of Engelsberg Bruk (also spelled "Ängelsberg" locally) not only includes the industrial buildings used for iron making, but also workers' residences and the manor of the owner's family. Visiting the site by public transport is a bit tricky, but manageable - Ängelsberg is on the regional train line between Västeras and Ludvika (with connections to Falun). From the station it is about a 25-minute walk to the site (the local tourist office is located along the way, and the staff there were friendly enough to let me store my suitcase there). The peaceful shady ambience if this site belies the noise and smells of the site that must have pervaded the area when the ironworks was in operation. I reached Angelsberg by train from Falun while on the way to Stockholm. The friendly staff at the tourist office (in the station building) gladly looked after my luggage while I walked up the road to the site through an outdoor sculpture park. Three hours on a train from Sweden’s capital Stockholm and you find yourself in an area where the iron making traditions goes well back to the Middle Ages. Iron, copper, silver and gold mining together with the forest industry – two industries working closely together - has formed the back-bone of the Swedish economy and rise to power ever since the 16th century. It was back then, when skilled miners came from central Europe to the cold north, seeking their fortunes in the depth of the Scandinavian wilderness. And indeed some of them did. 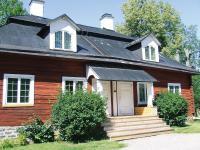 At Engelsberg it all started with a German immigrant, the miner Englika, who settled here by the end of the 14th century. In 1681 an industrial site for iron works was established and during the 18th and 19th century it developed into the most modern iron works of its time. A mansion was added together with workers homes, offices and other buildings. 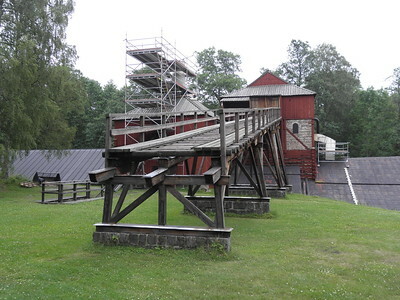 Engelsberg is also the only ironworks in Sweden that has preserved most of the original equipment. All operation ceased in 1919. 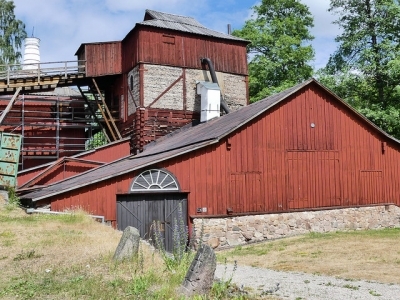 On a small island in lake Åmänningen, just a kilometre away from Engelsbergs Ironworks, you will find another interesting industrial heritage, the Oil Island - the world’s oldest preserved oil refinery. 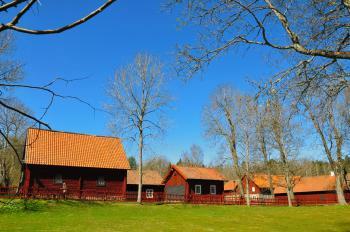 Though it does not belong to the World Heritage Site of Engelsberg – it is still an interesting place to visit. Guided tours are available on both sites during summer months. Engelsberg Ironworks are a very early industrial monument – a WHS category of which there are in my opinion too few representatives. ”. Made primarily of wood they do not give an “industrial impression” being set in green and wooded country in what is now a “country park”. Nearby lies the Manor house. They originally dated from c1680 but the preserved buildings are as at 1870.Unfortunately when we were there on a weekday in early June the buildings were not open – but there was plenty to see just wandering around:- A range of production buildings including a Blast Furnace and a Mill together with offices, shops and workers accommodation. . Perhaps it is all a bit too idyllic now and difficult to capture the atmosphere of smoke, fumes and backbreaking work which must have the case. Nevertheless – well worth a detour! Nearby are the remains of primitive Iron age furnaces and some plants of the contemporary Swedish steel industry providing an interesting example of continuity of human activity based on local natural resources. Named after individual people: "The works gets its name from Englika, a homesteader of German origin, who came here in the 14th century"